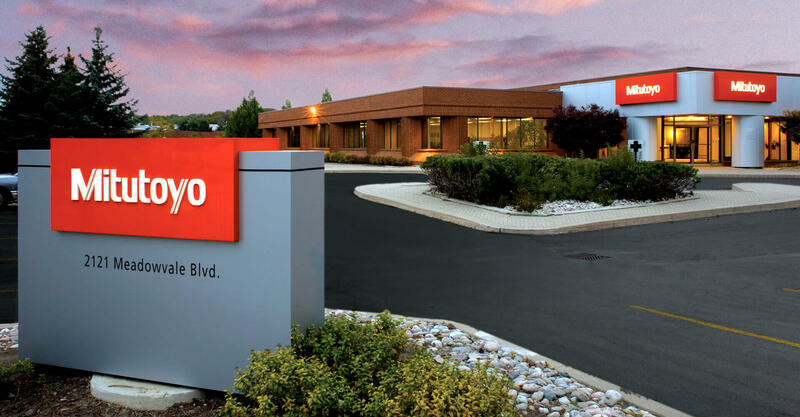 Mitutoyo Canada is the Canadian distributor for the world’s largest metrology company. 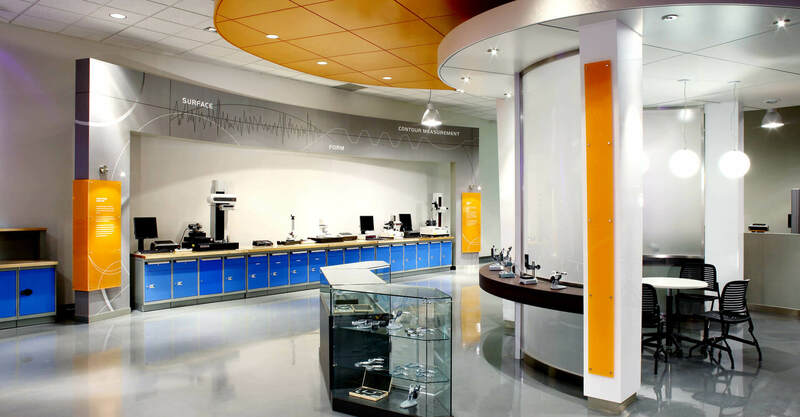 Located in Mississauga, the company has provided sales, service and repairs for precision measuring and calibration instruments since 1979. 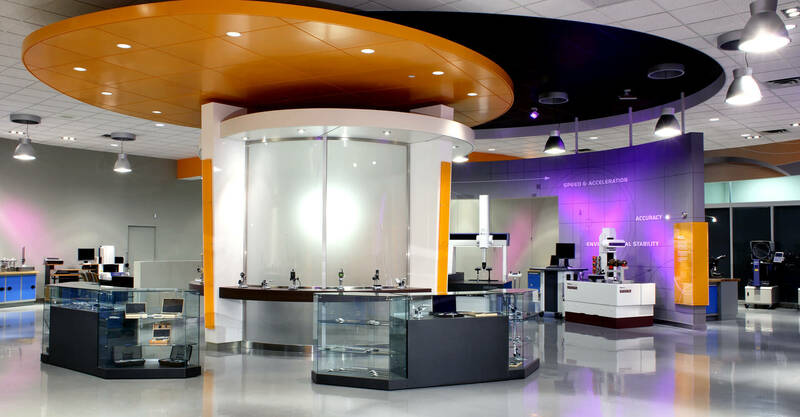 The existing customer showroom and reception were original, developed when the building was first constructed. It was aesthetically dated and did not reflect the precision and highly engineered aspect of the Mitutoyo brand. 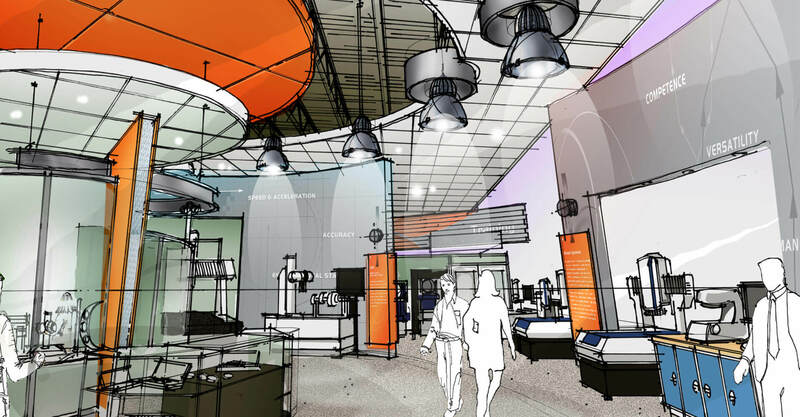 We were retained to develop an environment that would welcome customers and staff into an atmosphere that embodies the dedication to quality and service for which Mitutoyo is recognized, while simultaneously acting as a foundation upon which Mitutoyo can create new retail strength. 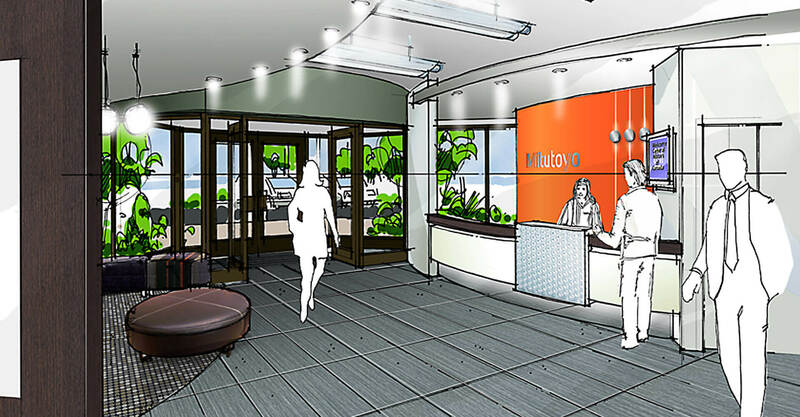 The reception area creates an immediate impact and impresses upon the customer Mitutoyo’s status as an industry leader. Relocating the reception desk to one side created a direct visual and physical path to the Retail area. Heavy manual pull doors were replaced by automatic sliding glass doors that draw the viewer into the sales showroom. 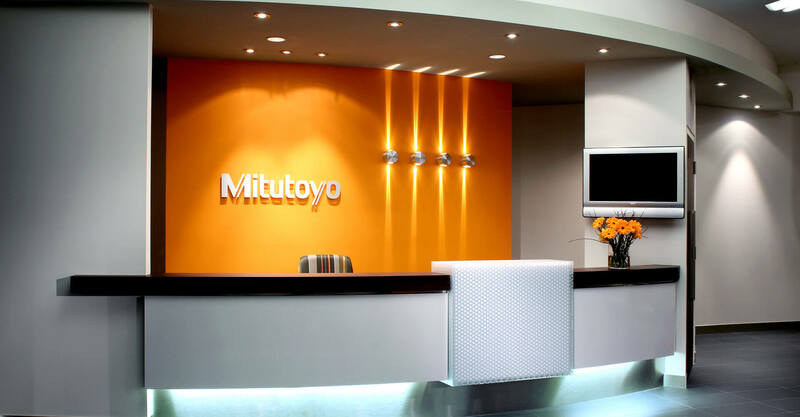 An identity wall behind the reception hides administrative functions and displays three distinct brand cues: the color orange, nomenclature, and the ‘Blade’ light fixtures that project the precision and accuracy of Mitutoyo’s products. An existing wall separating the retail space from the administration became a new display area. 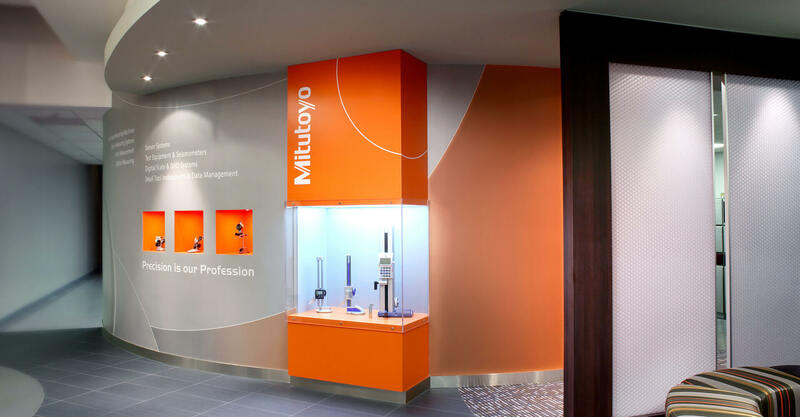 This curved brand voice wall acts as an ambassador of the Mitutoyo brand. Three niches display smaller calibration tools while the large acrylic display can accommodate a machine weighing up to 500lbs. The waiting area overlooks the Japanese gardens surrounding the building. Custom curved backless benches and the simplicity of the colour palette create a sense of overall design aesthetic through colour and shapes that echo the culture of the company. The original 4000 sqft. 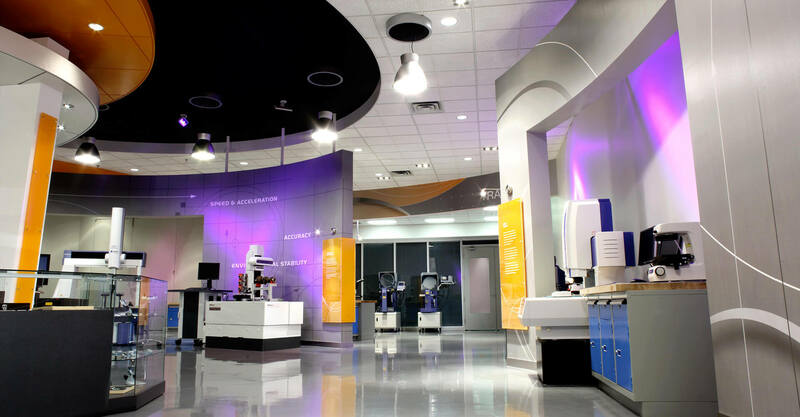 showroom consisted of open space, an enclosed office and a training room at the back. 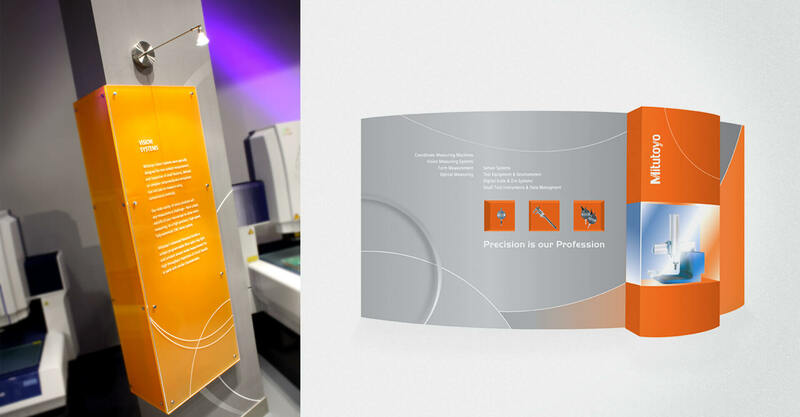 Our new concept created curved walls with product attribute and benefit graphics highlighting the key features of the equipment. These walls and the intersecting bulkheads are evocative of the machined products created by the industries that Mitutoyo serves. Clean lines, precise graphics, and dynamic LED lighting all serve to create an innovative and cutting edge atmosphere of precision and performance. 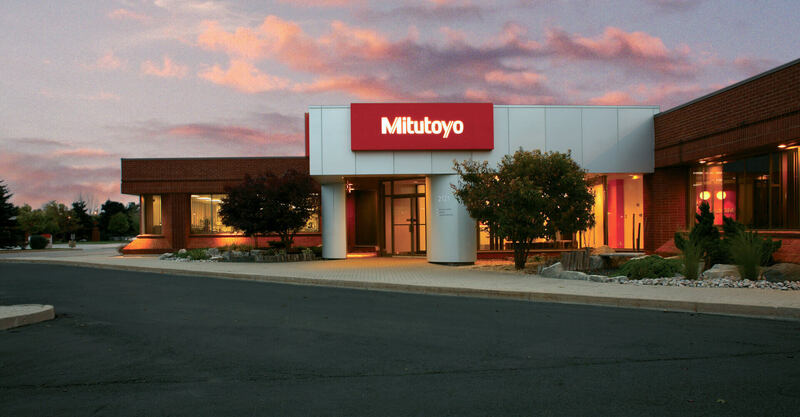 The renovated space represents Mitutoyo’s commitment to quality sales and service, generating a vision that is a strong reflection of the Mitutoyo brand and allows customized demonstration of the Mitutoyo equipment. Comparing initial concept drawings to the final build highlight our adherence to the concept throughout the construction process.